292 pages | 42 B/W Illus. Educating for Sustainable Development (ESD) approaches are holistic and interdisciplinary, values-driven, participatory, multi-method, locally relevant and emphasize critical thinking and problem-solving. This book explains how ESD approaches work in the Japanese context; their effects on different stakeholders; and their ultimate potential contribution to society in Japan. It considers ESD in both formal and informal education sectors, recognizing that even when classroom learning takes place it must be place-based and predicated on a specific community context. 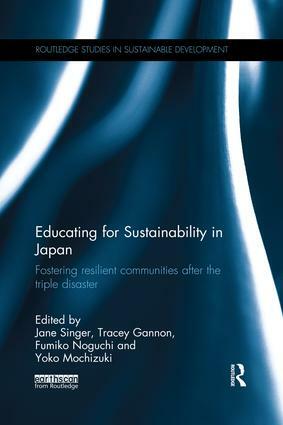 The book explores not only ‘Why ESD’, but why and how ESD in Japan has gained importance in the past decade and more recently in the wake of the triple disaster of March 2011. It considers how ESD can help Japan recover and adapt to disasters and take initiative in building more resilient and sustainable communities. This volume asks the questions: What are some examples of positive contributions by ESD to sustainability in Japan? What is the role of ESD in Japan in activating people to demand and work towards change? How can schools, universities and non-governmental organizations link with communities to strengthen civic awareness and community action? After an introduction that elucidates the roots and recent promotion of ESD in Japan, part one of this volume looks at the formal education sector in Japan, while part two examines community-based education and sustainability initiatives. The latter revisits the Tohoku region five years on from the events of March 2011, to explore recovery and revitalization efforts by schools, NGOs and residents. This is an invaluable book for postgraduate students, researchers, teachers and policy makers working on ESD.